Camping options are sparse along the route. This guidebook is illustrated with maps and the author's own full-colour photographs. The stage-by-stage route description is accompanied by overview maps at a scale of 1:100,000 (1cm to 1 mile). A more detailed map of the Way is supplied in booklet form, at a scale of 1:25,000, slid into the back of the book. 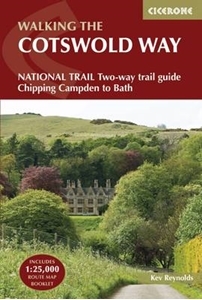 The Cotswold Way became a National Trail in May 2007, despite having been a much-loved walking route for more than 35 years. It follows the Cotswold escarpment, with dramatic and far-reaching views across the Severn Vale towards the Welsh hills, plunging down to visit honey-coloured villages, old market towns and the elegant and historic city of Bath.